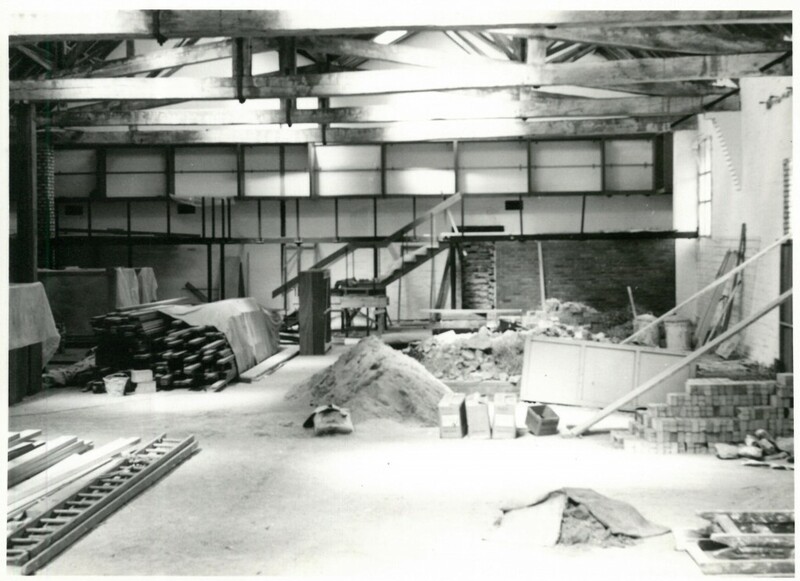 Our large objects and agricultural collections have recently been assessed and a comprehensive report produced specifically looking at the significance of the items and their condition. The museum has a brand new guide book available for sale for just £1.50. 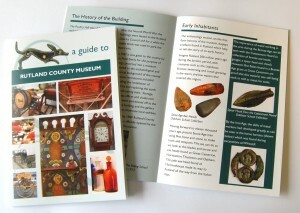 The book gives an overview of the history of the building and highlights the key artefacts and collections that are on display. Pop into the museum shop to pick up a copy! I found out lots of interesting social history facts which I interweaved into my exhibition: did you know that straw beehives called skeps were used during the Victorian period? They didn’t allow for the inspection of bee diseases and parasites and so were replaced by more modern hives. To get the honey out of even earlier hives (e.g. 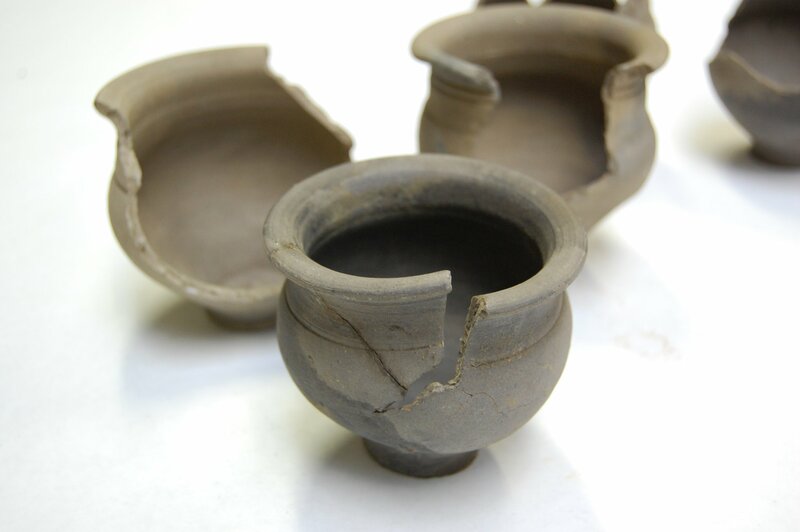 pre-1800s – though, 9000 year old pottery vessel beehives have been found in north Africa!) the whole colony was destroyed – at least the Victorian ones were better than this. 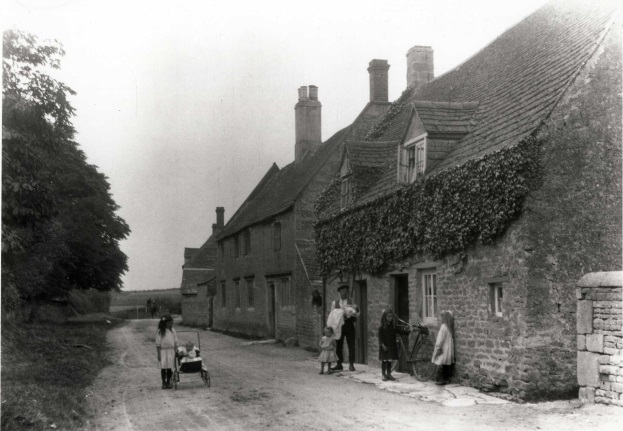 Villagers in Rutland using skeps. The museum’s fantastic volunteer Marion then arrived to help with collections. We are doing a collections audit of all our archaeology. This involves checking the location of thousands of objects. We then photograph them, measure them, document any extra information (e.g. 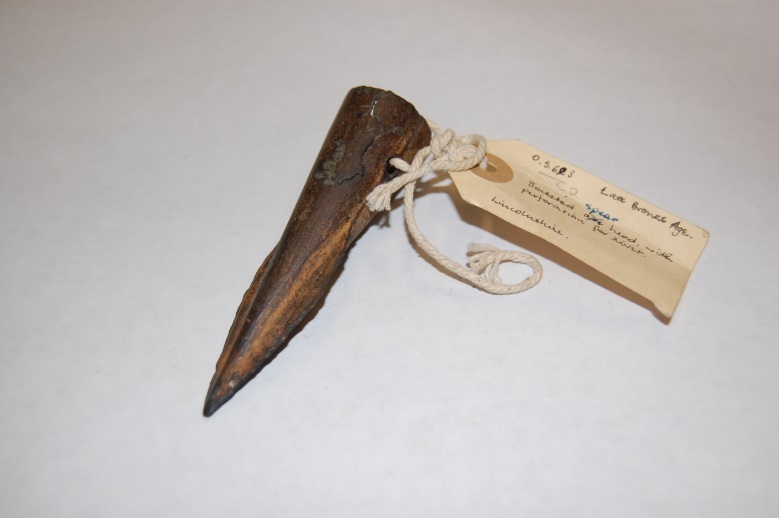 provenance), and check their condition to see if they need to be sent for conservation. Here’s a lovely Bronze Age socketed spear head in good condition that we came across. 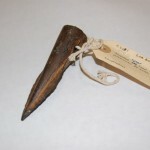 Attached to the artefact is a very useful label; because our artefacts originally came from many different collectors over the last 66 years and were accessioned (accepted into Rutland County Museum’s collection) by many different curators, the amount and type of information written varies considerably – most of the time we do lots of detective work. Today the museum has a structured accession policy which makes it very easy to find out useful information about any object. Objects myself and Marion particularly enjoyed documenting this day was this small collection of Roman pots – they cracked in the potter’s kiln and were consequently discarded. We can even see that their bottoms were smoothed. It’s nice working with objects like this because although they’re not functional or beautiful, they show a behavioural sequence/snapshot of an individual – showcasing everyday Roman life. I wonder if the first Romans who lived at Clipsham Villa in Rutland liked it here? 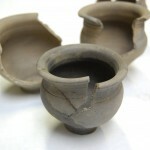 How did our clay differ for the potter? My manager Lorraine thought it would be good for me to get some hands-on conservation/cleaning experience and so to the stores we went. 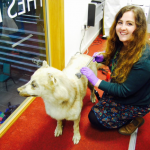 Our taxidermy husky is being loaned out of the museum to go on display and so we want him looking his best. Preparing the museum hoover (which reminds me of Ghost Busters), we attached a thin piece of material with small holes onto the vacuum head. This allowed us to catch any big pieces of the specimen that could have fallen off. I’m wearing gloves as it’s likely this specimen contains arsenic! In Victorian times this was one of the principal substances used in the preparation of skins for taxidermy. As the Yellow Earl’s favourite pet, this specimen is old and so I took care and my time to clean him with small strokes. I then completed a condition survey where I pointed out what was missing from the specimen (most of 1 ear and a few toe nails) and patches with scarce fur: this is to inform the museum he is going to. 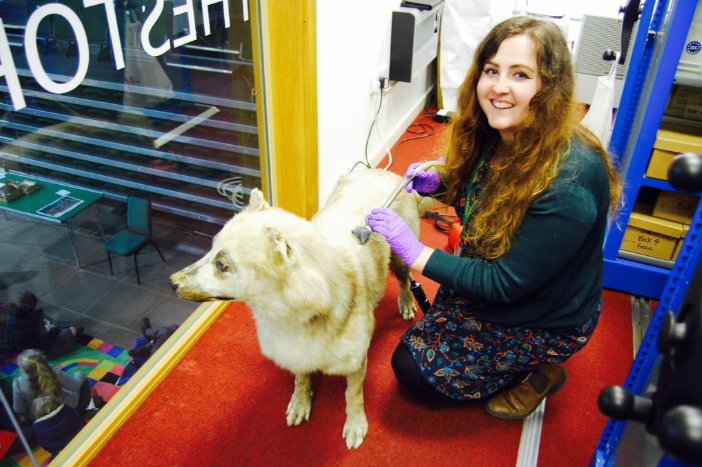 My colleague Emma said that the school children below on their school trip asked why I was shaving a wolf. This made me laugh. I got thinking about this Oakham Earl and did some research. He loved yellow and was the first president of the Automobile Association (AA). His name was given to the Lonsdale brand. He explored arctic Canada in 1888 and donated Inuit artefacts to the British Museum – it’s a shame Rutland County Museum wasn’t around at this time! We could have had some anthropology in our collection. 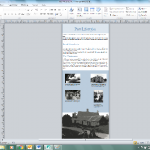 It was then time for me to go home – all in a day’s work! I absolutely love my job. I love working with objects and learning new things and I especially love passing this on to others. My role enables me to do all of these simultaneously; it’s the perfect job for me. Walking on a beach, do you stop to admire a nice looking rock? I do. I have a nice shiny Tanzanian rock sitting on my bookshelf – every time I look at it I am flooded with fond memories of my travels. Victorians liked to do this too. They particularly liked those they thought to be hand axes. 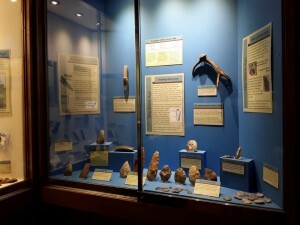 Before the Victorians and before the Stone Age was known to exist, some people thought that stone tools were the remnants of lightning bolts. Some even thought they were Roman: woolly mammoth bones with a stone tool were found in London and deemed Roman elephants from the time of Emperor Claudius. Eventually, the antiquity of humanity was realised and a classification system for stone tools arose. People longed to find older and older tools – tools which were indicative of the origins of tool making and the earliest humans. The Victorians were finding thousands of very crude tools and these were popping up in museums everywhere. The problem was, they couldn’t distinguish between humanly -worked stone and those modified by natural processes like falling off a cliff. These are called eoliths. Eoliths typically have fractures and look usefully sharp and so were widely accepted as artefactual. This was becoming an important issue as the presence of eoliths in very early Stone Age sediments was being used to prove that ancient humans were in Britain from 5.3 million years ago. Relating to nationalism, Britain was yearning to be the centre of the world and the evolutionary ‘birth place’ of mankind and tools as ancient as 5.3 million years, made Britain this piece of the puzzle. Presumably not liking Britain taking this limelight, French prehistorian Marcellin Boule argued his theory in 1905 that eoliths were stones modified by natural processes like frost and mechanical shattering. It wasn’t until the 1930s however that eoliths were objectively demonstrated and generally agreed that their characteristics were homogenous with natural formation processes. Today it’s known that the earliest humanly-modified stones are found in Africa and are 3.3 million years old. 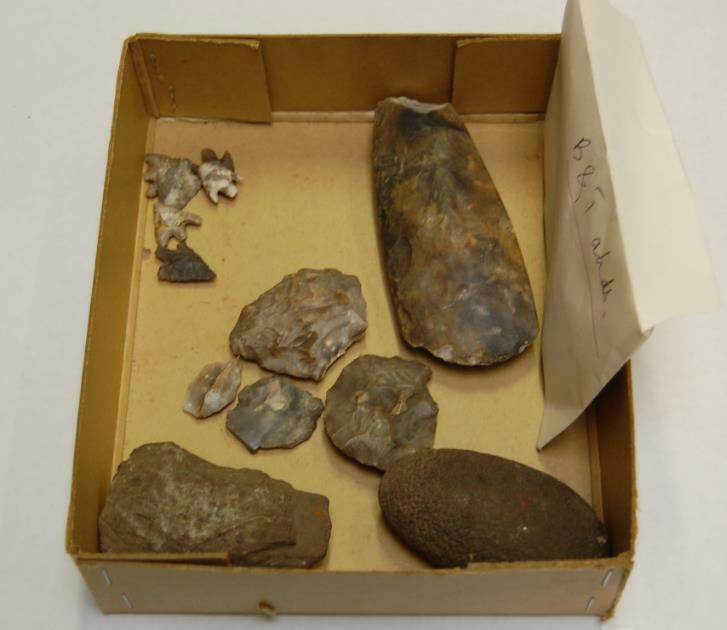 So how do we decide what’s a real stone tool? 1) A bulb of percussion and conchoidal fracture(s). This arises from the elasticity of the flint. What do eoliths mean for museums? Rutland County Museum’s Eolith with no bulb of percussion. The British Museum among others holds many eoliths. Obviously these are using up lots of space which real hand axes could have. However, these stones can provide us with valuable and interesting information. Information can be revealed about the collector as well as the history of stone tool classification. The fact our predecessors had this debate about the authenticity of these stone tools is interesting. 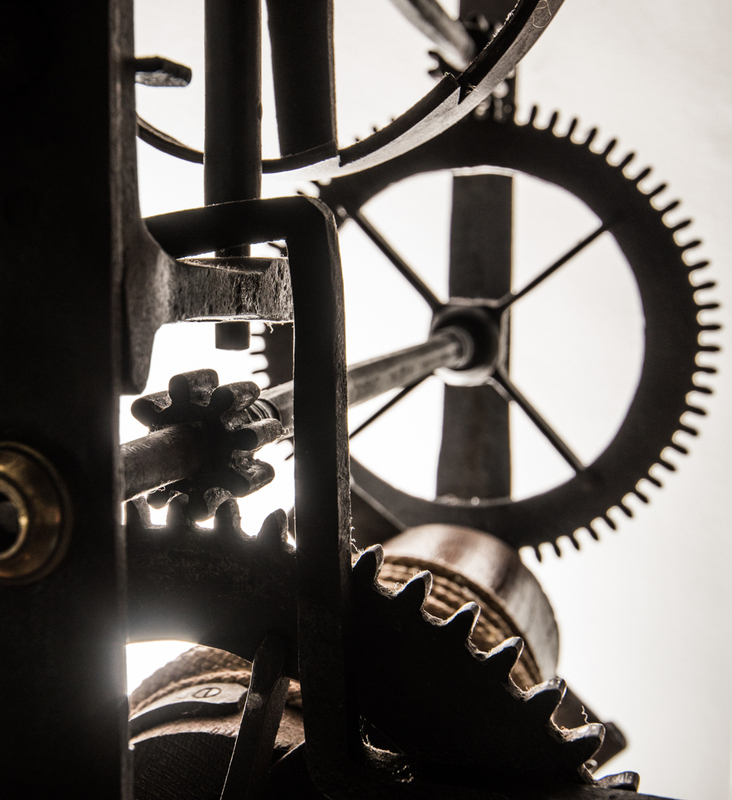 These objects are then part of the history of ideas which museums are here to tell. What do you think the smaller museums should do? I think eoliths shed light on an important episode of Palaeolithic Archaeology. Typically, the smaller museum isn’t burdened by thousands of these stones so they’re not too much of a problem. Some museums have audited the eoliths and kept a small representative sample and have disposed of the rest. I’ve seen eolith museum gardens featured on the internet. Of which small plaques could then inform museum users the stories behind them. For now, Rutland County Museum’s eolith is safe on the shelf. 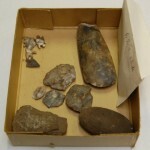 A sample selection of Rutland County Museum’s flint tools (differing ages). 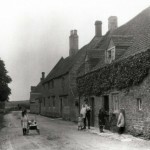 Prior to my role as a Collections and Interpretation Intern at Rutland County Museum I did not know much about Rutland. Admittedly, I presumed it was part of Leicestershire. Now understanding it’s the smallest county in England and given its rich history, I thought it would be great to share what I’m learning through a blog. My interests lie heavily with the Old Stone Age and so I will begin here with the Palaeolithic. This is the earliest prehistoric period — think before iron, before bronze, before farming and permanent settlements. Importantly, this was a time when people lived off the land, utilising natural resources from their environment – making stone tools much like The Flintstones! 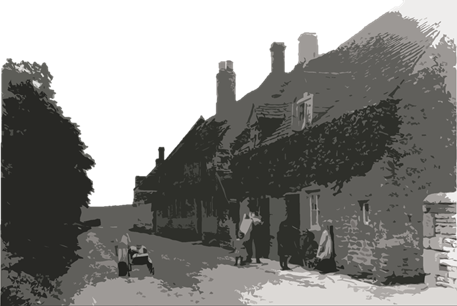 It’s worth bearing in mind that compared to other counties, little is known about Rutland’s Palaeolithic: Rutland has no caves which make ideal preservation areas for archaeology to last the centuries. Ancient humans occupied southern Britain intermittently from nearly 1 million years ago (800,000 years)! Though not like us, they were actually quite close to ‘becoming’ human. Living in Rutland was impossible until 130,000 years ago as a huge ice sheet covered the county before then. Rutland’s earliest evidence for ‘human’ occupation comes from [the more recent] Upper Palaeolithic [roughly between 50,000-10,000 years ago]. This was a time when modern humans made it to Britain over the ‘land bridge’ that connected us to the continent – a time when the climate warmed. 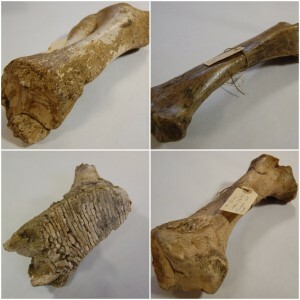 In 2000, archaeologists unearthed Stone Age animal bones and flints from Glaston. 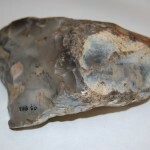 Finding a particular spear tip (flint leaf point) provided the find’s early Upper Palaeolithic date: tools of this type date in the lab to around 30,000 years old. This was a time when Rutland’s inhabitants likely included 2 species of human: us and Neanderthals. This makes it really hard to determine who the maker of this tool was! Here, the treeless landscape allowed herds of herbivorous animals to roam. Excitingly Rutland County Museum contains fossils of woolly rhino, bison, horse, reindeer and woolly mammoth. Our hunter-gatherer ancestors did not however live an easy life with spotted hyena, cave lions, wolves, and cave bears around. I’m yet to spot these in the stores. 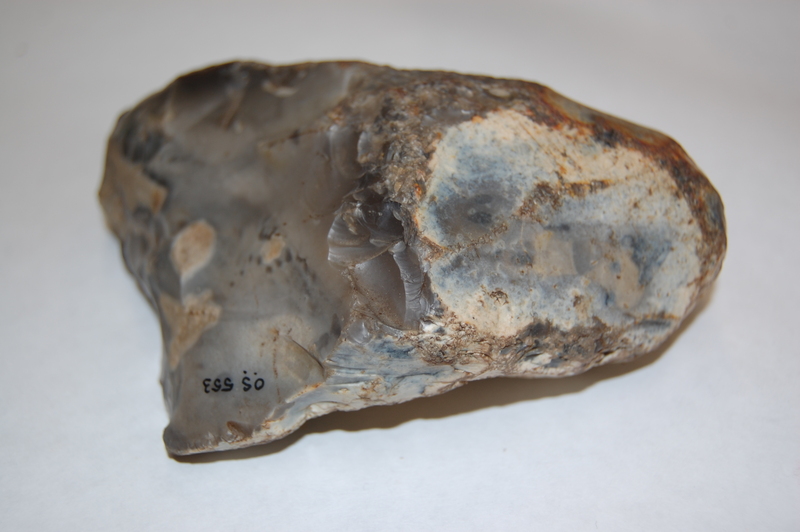 Glaston produced few flint tools but the ones it did were fresh – they hadn’t be used many times before. It makes sense then that it’s recognised as a temporary hunting camp; a place where people on the move would have hunted and consumed meat which we know was horse! The bones tell us that they were extracting their very nutritious bone marrow too – I’m yet to try it but keep spotting it in supermarkets. Hyena also inhabited the site before or after the people left: they dug their own dens in the soft sands. The gnawed bones tell us the hyenas too enjoyed a feast. Our ancestors must have interacted with hyenas sometimes – I wonder if these relationships came near to those we’ve recently watched on BBC’s Planet Earth 2? 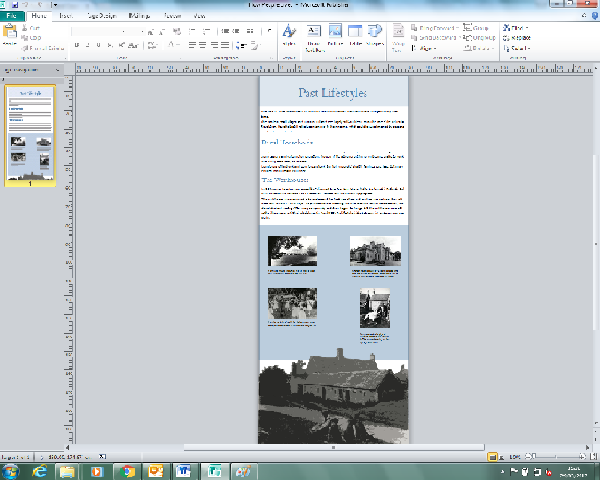 Around 20,000 years later the site of Launde was used as a short term ‘home’ by our ancestors. This wasn’t a cave but an open air place, so it’s possible a shelter was made. The 3000 pieces of ‘fresh’ flint tools / debris among a central hearth suggest it was a place for stone tool manufacturing and maintenance. Nearly all of these tools are left unfinished. Did something happen that made these people leave the site in a hurry? 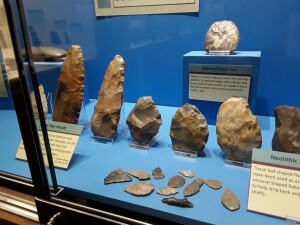 Probably not – Launde’s boulder clay geology would have provided much flint: Flint would have been so easy to come by that tools may have been left behind as more could easily be produced. Launde would have been a great location for overlooking prey across a wide plateau – providing similarly good views for intercepting prey like at Glaston. 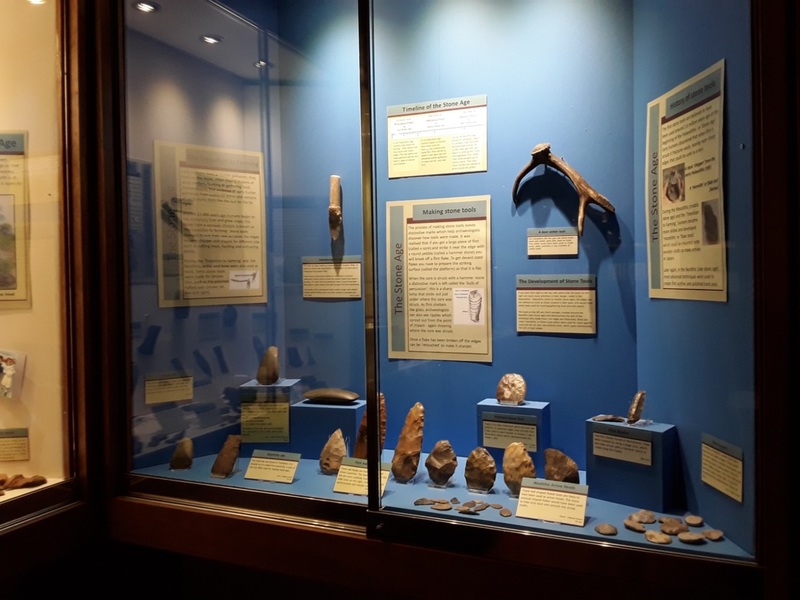 If you’ve been interested in Rutland’s ‘Flintstones’, take a trip to Rutland County Museum to see some of the Stone Age for yourself!